Apple is hot. Whether you like it or not, whether you are a Windows or Mac freak or just that average consumer behind his desktop or notebook, Apple is everywhere. My personal interest in Apple products began with the introduction of de stylish PowerBooks and powerful PowerMacs. The designs are simply beautiful. Of course the iPod also caught my eye, and especially Apple's latest introduction of a video version of the Apple iPod is of great interest to me. 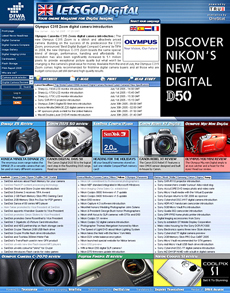 It features a sharp and colourful display and is able to show me my favourite video clips, films and pictures. A whole bunch of them because the storage capacity reaches up to 60GB (Apple offers 30 and 60GB models). The first Apple iPods only played songs, then it expanded to photos and on the way 'pod casting' was invented, today the iPod plays video as well. Apple sent me the new black coloured iPod 60GB version. I took some time to get into iPod! Apple iPod LCD display - The design of the iPod looks similar to that of previous products, but it has a finer and slimmer build. In a way, the design was not a surprise, but well why change a success story for something unsure. Its dimensions are just great. Imagine those old hard disks you had in your desktops, bulky and heavy. The Apple iPod is in fact a hard disk with extended features. It is quite astonishing that Apple is able to create a device with such ultra small dimensions and up to 60GB capacity. It is about 10 percent thinner than the 4th generation 20GB iPod. 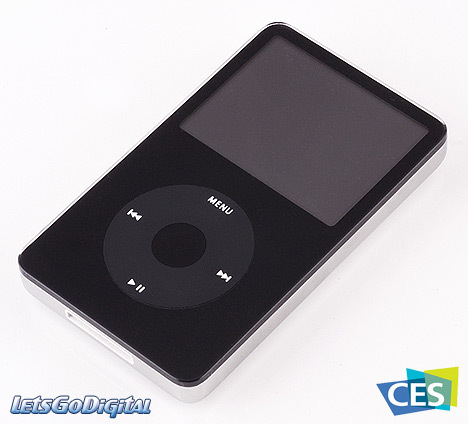 The new iPod version features a larger format LCD display of 2.5-inch format with a QVGA resolution. Viewing a video in more than 65,000 colours is just great. Ok it would be even better to view them on a 3-inch + display, but we settle for this one. Apple iPod Video Control - Of course you want to activate the Apple iPod as soon as you hold it in your hands. Read an instruction manual? No way, just try it out immediately. I have to say, being confronted with the first iPod in my hands, the control of it is pretty straightforward. Even the touch-sensitive wheel on the front of the iPod offers real intuitive navigation. This kind of control is really easy and straightforward for everyone. Just slide your finger easily up or down in a half-circle and watch the screen. Another way of controlling the Apple iPod is via the optional Apple Remote accessory. Connect the iPod to your television set via the universal dock (necessary in combination with the remote control), and view the slide show of pictures with your family and friends. It is striking how well thought-out the whole concept is. iPod Video - Of course the key feature of the iPod is the capability of playing video. The new Apple iPod supports a broad range of video formats. First of all H.264 video, file formats m4v, mp4 and mov up to 768 Kbps in a resolution of 320x240 pixels with 30 frames per second. The baseline profile up to level 1.3 Mbps. Looking for MPEG-4 video? Then you got support from m4v, mp4 and mov and video up to 2.5 Mbps in a resolution of 480x480 pixels with 30 frames per second. The video clips or movies on the iPod run smoothly, perfect! Plug the A/V cables in the Universal dock and connect it to a television. That's when a negative point shows up. Due to its limited resolution of 320x240 pixels, although perfect for the integrated colour LCD monitor, the full screen video doesn't look good enough on your television. Its resolution is too low. So what we have here, is a perfect portable viewer capable of casting the latest video and audio content, but it doesn't like to be integrated in your multimedia home set. Well I can live with that. 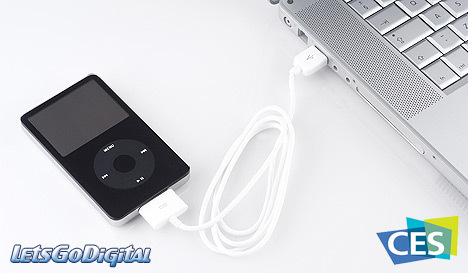 Apple iPod Image viewer - The iPod is also capable of storing your digital images. When using the optional Apple iPod camera connector you can easily connect your camera directly to the iPod and upload your images to the iPod. Personally I find the iPod the ideal package. During my short holiday it gave me the joy of carrying all my favourite music with me and now even video belongs to the possibilities, but it also enabled me to empty my flash card so I was able to continue my shooting. Apple iPod Video review conclusion - "What can I say? I love the iPod. And although there are a lot of competitors in the game that are more or less providing the 'perfect' solution, I admire the way Apple evolved the iPod with the video feature and the finishing touch of the design. Although a larger screen would be more convenient, the playback looks perfectly sharp. The new iPod is part of the one big concept where iTunes plays a leading role. With the ability of buying your favourite music and video in the Online iTunes Music store there is plenty of content to keep you company... As an image backup device it functions excellently. JPEG is supported so your images are easily played back. RAW is not supported though you are able to store them via the Camera connector. Battery life is pretty amazing, up to 20 hours for music playback, running a video will decrease the capacity to 2 hours. The iPod is the perfect device for the young and old" Upgraded with some nice extra features and better performance the iPod will give you an excellent deal!